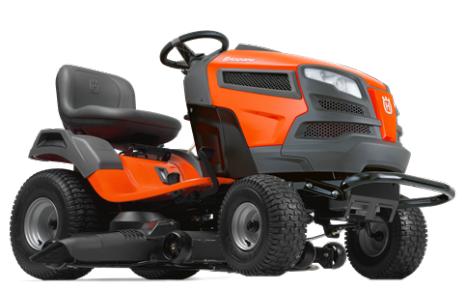 Husqvarna has released an exciting new range of rideon mowers for 2017. Innovative new features, new cutting decks, Japanese Kawasaki engines - more features all at a lower price than last year! The range is called the TS series. 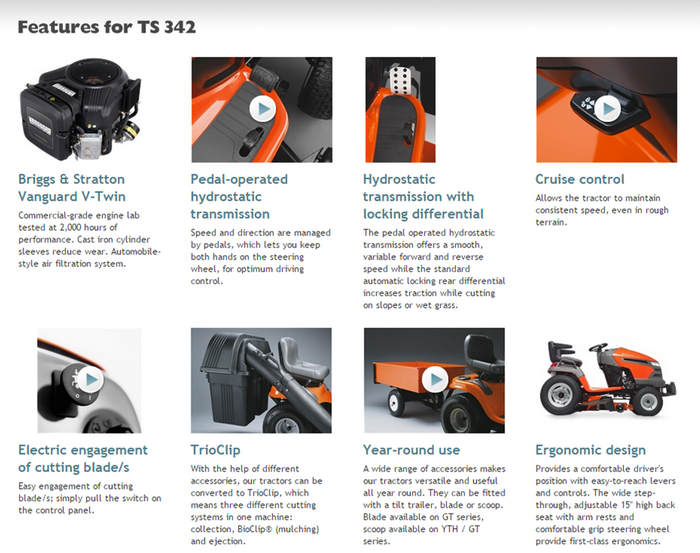 The TS 242 is ideal for homeowners and landowners with larger gardens who need a durable and comfortable tractor with high manoeuvrability. 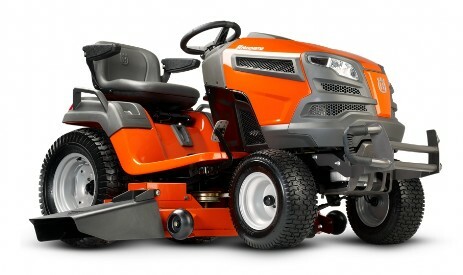 It is a powerful tractor with side ejection for demanding lawn care. 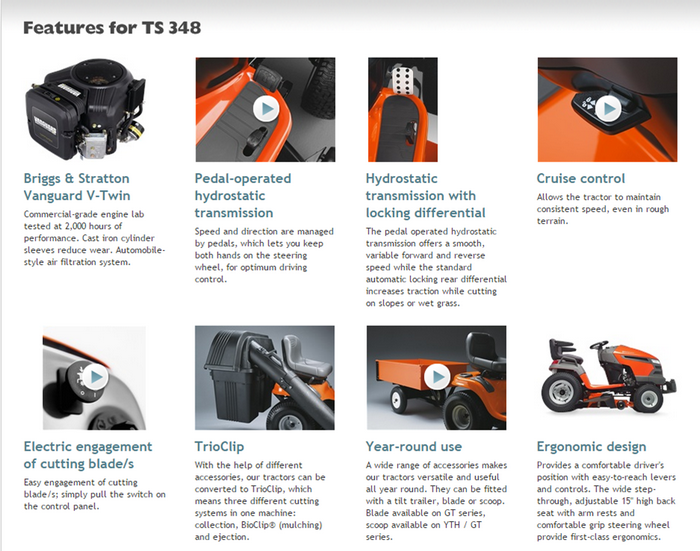 Because the cutting deck ejects clippings, you get maximum capacity even on areas that are cut less frequently. The locking differential transmission gives superior traction in slippery conditions and slopes. Driven by a powerful Japanese made Kawasaki, twin cylinder engine that will last for years. Pedal-operated hydrostatic transmission and cast front axle means easy, trouble-free operation. Extra reinforced, pressed deck, air injection spindles and deck flush port make for one of most proven decks available. Collector and BioClip® kit are available as accessories. scoop available on YTH / GT series. stability, even with a collector. Pivoting front axle ensures good balance and excellent driving comfort. flow which results in greater grass lift and superior cut. The TS 246 is ideal for homeowners and landowners with larger gardens who need a durable and comfortable tractor with high manoeuvrability. 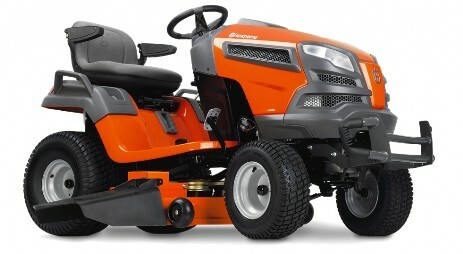 It is a powerful tractor with side ejection for demanding lawn care. 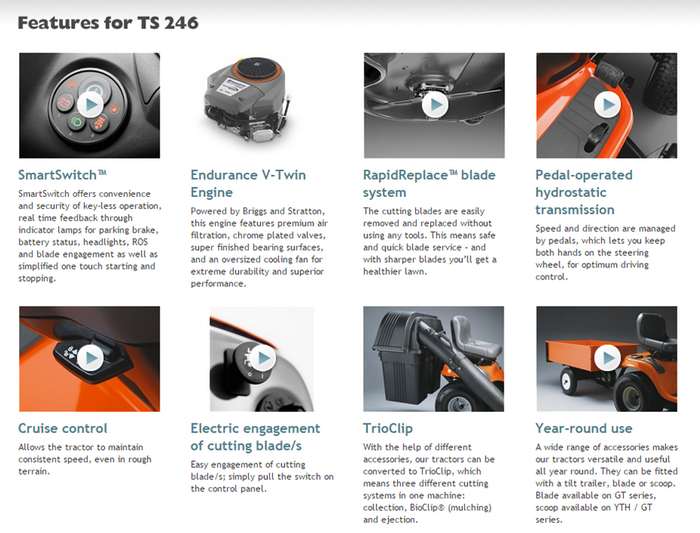 Because the cutting deck ejects clippings, you get maximum capacity even on areas that are cut less frequently. The locking differential transmission gives superior traction in slippery conditions and slopes. Driven by a powerful Japanese made Kawasaki, twin cylinder engine that will last for years. Pedal-operated hydrostatic transmission and cast front axle means easy, trouble-free operation. Extra reinforced, extra large discharge chute. pressed deck, air injection spindles and deck flush port make for the best deck available. Collector and BioClip® kit are available as accessories. 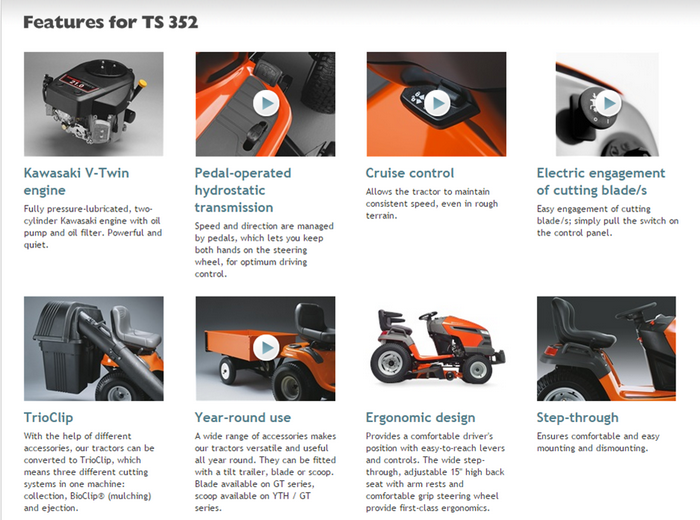 The TS 342 is a high spec tractor designed for landowners who frequently need an efficient machine on really large areas all year round. 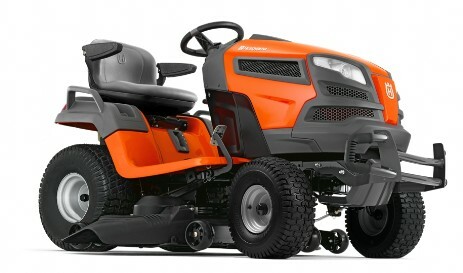 It is a powerful tractor with side ejection for demanding lawn care. Locking differential gives superior traction on slopes and in slippery conditions. Pedal-operated hydrostatic transmission and cast front axle means convenient and trouble-free operation. Driven by a commercial graded Kawasaki, twin cylinder engine. ClearCut™ fabricated cutting deck which not only offers rock solid durability but also industry leading performance and cut quality. The TS 348 is a high spec tractor designed for landowners who frequently need an efficient machine on really large areas all year round. 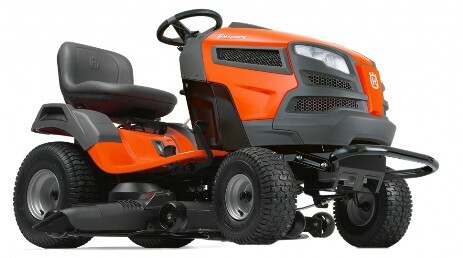 It is a powerful tractor with side ejection for demanding lawn care. Locking differential gives superior traction in slopes and slippery conditions. Pedal-operated hydrostatic transmission, a rugged fabricated deck and cast front axle means convenient and trouble-free operation. Driven by a commercial graded Kawasaki, twin cylinder engine. All new clear cut deck gives superior grass discharge and catching ability with optional catcher kit.